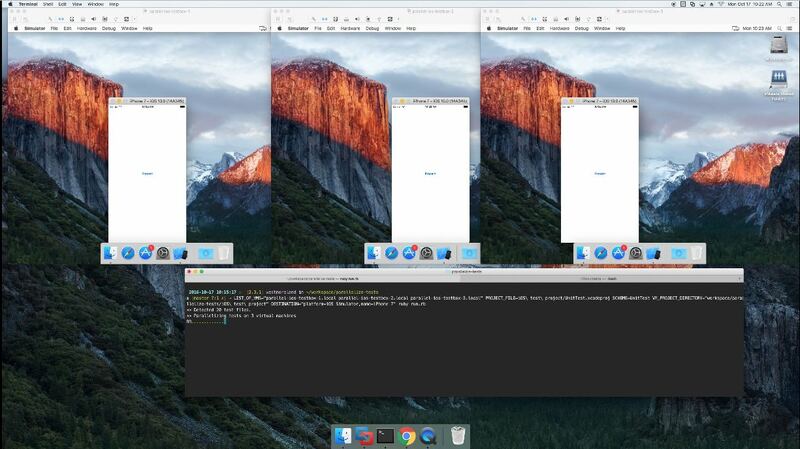 This article explains how to run iOS UI tests in parallel on a OSX host running multiple guests OSX virtual machines–the objective is to speed up a time consuming iOS UI test suite. You can find the script, its dependencies and a test project on github. I really hope to save someone’s hours of time I spent on UI testing parallelization dead ends. Xcode8 has a xcodebuild option called --only-test to run single test files–our proof of concept Ruby script collects the Xcode project test file list and runs them via ssh on multiple virtual machines–legally–running OSX. This script doesn’t allow to distribute test functions across virtual machines even if that is a valid option to --only-test. Our test project has around 15 tests–some with sleeps–and it takes around 20 minutes running on a single iMac (16GB ram, 3.5 GHz Intel Core i5 quad core). This script runs them in 7/8 minutes (with 3 virtual machines running on the same iMac). During our tests we confirmed that a shorter 2/3 minutes test suite did not benefit from this virtualization. As a project grows sets of diverse features over months and years its UI tests will increase and so will the suite execution time. Apple doesn’t make it easy to parallelise a test run–its xcodebuild has an option to parallelize a build but not the automated tests and its xcode server doesn’t support parallelization at the time of this writing. At the time of this writing researching this topic online lead to a lot of dead ends and I felt compelled to write a blog post about our proof of concept solution. Facebook’s xctool list test run parallelization but during our tests that was true only for unit and not for Apple’s UI tests. Amazon’s AWS device farm allows to spread UI tests over a number of different devices but not to parallelize in order to reduce execution time. Running multiple simulators on a single OSX workstation was a dead end. 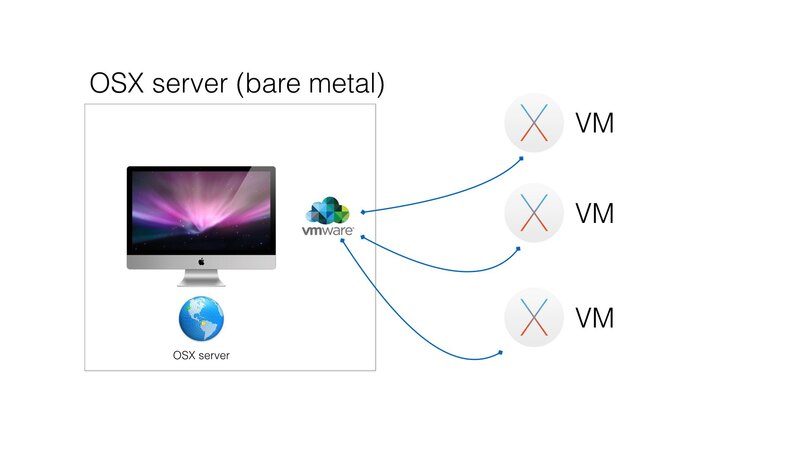 Running multiple physical devices connected to a OSX workstation would allow parallelization but it wasn’t a suitable solution for us. NOTE: Oracle’s Virtual Box is a free alternative to Fusion but it was giving us a hard time finding the OSX recovery partition to virtualize OSX. The setup of the first virtual OSX box is manual–it can then be cloned to increase the size of your virtual boxes test farm. 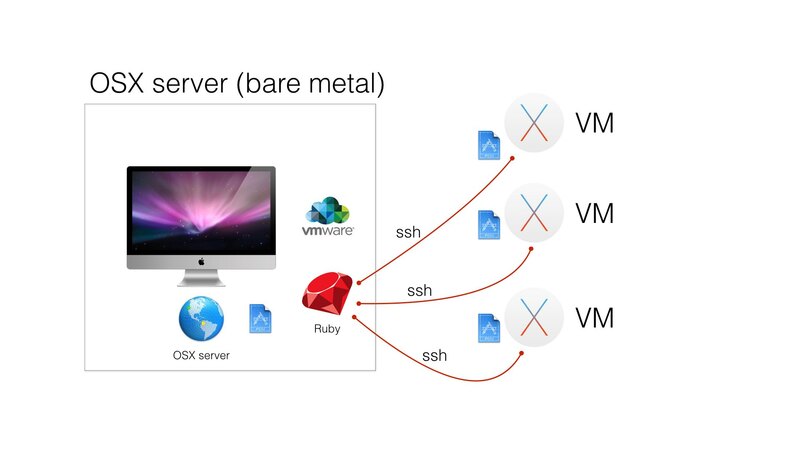 Once the VMs are setup the Ruby script run.rb will inspect the project on the host, find the test files, distribute them to available guests (virtual machines) and finally collect the test results and logs. This solution was developed during research and development as a proof of concept. It’s only been tested on a test application. Your milage may vary. From now on we will refer to your workstation (or CI server) as the HOST. You will run the run.rb script from the HOST. Currently all the variables have to be provided via ENV variables ie. More information–including failures whole xcodebuild outputs–can be found inside the timestamped logs in the script’s directory ie. ios-parallel-tests-20161010_1026.log. Before this I was thinking virtualizing OSX was hard and illegal but it turned out to be legal, very simple and a great way to distribute iOS UI tests. Tim Kersey and I paired on this during research and development time at Pivotal Labs in Santa Monica. You can find the code of the proof of concept on GitHub.